Spokane has a rich aviation/aerospace history, and the entity that owns and operates its airports is relying on that background to grow. Plans for growth, however, extend well beyond airport facilities and traffic to include the overall economy of Eastern Washington. Between 2005 and 2012, Spokane Airports invested approximately $14 million in five hangar projects at Spokane International Airport (GEG). Of that $14 million, about $8.4 million came from the WA Department of Commerce's Community Economic Revitalization Board - $1.2 million in grants and $7.2 million in loans. The remaining $5.3 million was funded with the airport's cash reserves. Projects included a mix of new construction and renovations of existing hangars. Larry Krauter, CEO of Spokane Airports since 2011, explains that two factors prompted the various hangar investments. In some cases, facilities needed to be replaced; in others, officials saw opportunities to make investments based on likely returns to the airport and the community in terms of job creation. "That was really one of the big poles in the tent for us," Krauter says. "How do we continue to grow the airport's overall economic impact in the community? We see that as attracting companies that are going to bring well-paying jobs to the area." According to a 2013 report, Spokane's airports generate $754 million in economic impact annually. Among GEG's projects was construction of a $2 million, 18,235-square-foot hangar to be leased by Absolute Aviation (an aircraft repair facility) and Empire Airlines, a feeder for FedEx. The airport also rebuilt an 80,000-square-foot former military hangar to help attract Cascade Aerospace, a heavy maintenance repair and overhaul company from Abbotsford, British Columbia. Cascade was subsequently bought by Air-Tech, and the lease was assumed by Aero-Flite, a supplier of aerial fire retardant and suppression systems from Kingman, AZ. Aero-Flite started with 30 employees and four aircraft in November 2014; currently, it operates nine aircraft and employs more than 60 people. "And that could double within the next 12 to 18 months," notes Todd Woodard, airport spokesperson. Growth is occurring elsewhere at GEG as well. Airport-based businesses have increased their employment levels and expect to add even more jobs within the next few years - providing the very type of return Spokane Airports was hoping for from its investments. "Employment is a big deal to us," comments Woodard. "Growing great aerospace jobs - which are sustainable, living-wage jobs - helps our airfield with the services; but it also helps the local economy grow." Ample, qualified labor is also part of the plan. Spokane Community College runs the state's oldest aircraft maintenance program, and Fairchild Air Force Base provides a steady supply of skilled veterans. "We have a good supply of talent now and into the future for these jobs," Woodard notes. 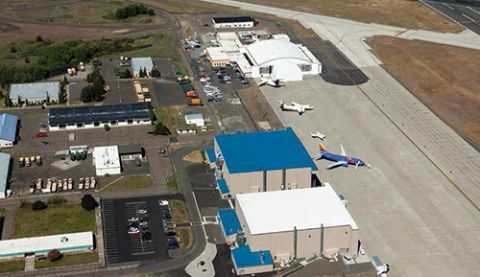 In mid-2012, Spokane Airports invested $1.1 million in a 32,000-square-foot hangar remodel, performed by Meridian Construction. Horizon Air leases about 19,000 square feet of the structure for its operations. The project was funded by airport general revenues and a $40,000 state grant. The airport's largest investment was a $7 million paint hangar for Associated Painters, which relocated some of its business from Everett, WA, to Spokane. Associated Painters is a division of Leading Edge Aviation Services, a commercial, military and executive aircraft painting company headquartered in Costa Mesa, CA. After the airport completed its 42,000-square foot-hangar project, Associated Painters funded construction of a mirror-image structure that opened in summer 2014. After undergoing a series of mergers, the company is now part of EirTech, based in Ireland. "There is a high demand for narrow-body aircraft painting in the region, which we plan to meet with this new hangar," says Chris Harano, president of Leading Edge. The company expects to grow its local workforce by 50% in the next year. The focus on airport investment and regional economic growth extends to GEG's general aviation cousin, Felts Field Airport (SFF). "We've been focusing on rebuilding the infrastructure there, and it's really paid off," says Krauter. SFF recently announced construction of a $2.8 million general aviation flight center, funded entirely by private interests. The 40,000-square-foot multi-tenant complex is owned by EFT and will be home to the field's fixed-based operator - Western Aviation - as well as Honor Point Military and Aerospace Museum. "You just don't see that kind of investment at general aviation airports these days," he remarks. SFF includes two parallel runways plus another turf runway when weather allows. Additionally, seaplanes land on the Spokane River, just north of the airport. "We've got something for everybody," Krauter muses. From an airspace aspect, SFF plays an important role by allowing separation of general aviation flights from commercial and larger business jet traffic at GEG, just eight miles away. GEG is served by six airlines and two cargo carriers; SFF's location makes it ideal for those looking to base businesses or aircraft for easy access to the Spokane metropolitan area, explains Krauter. Despite recent years of investment, he sees more room for development and reports that GEG, in particular, is in an "aggressive growth mode." Over the past several years, the airport has made substantial airfield upgrades and investments, including a recently completed taxiway reconfiguration project that included construction of three new taxiways on the northwest side of Runway 3-21. The curved taxiways (high-speed exits) are designed to allow aircraft to reach the gate area more efficiently and meet new FAA requirements, putting GEG ahead of many other airports. "We've got a lot of capacity, so there's room for opportunity here," Krauter reports. "We're looking to fill gaps in our services menu as well as to create additional jobs wherever we can." Woodard adds that GEG has been successful consulting current tenants about potential businesses and services to complement the airport's existing mix. Case in point: Two tenants suggested seeking out a paint company and helped airport personnel identify and recruit Associated Painters. "We have a target list, and we are going after those companies," Krauter advises. Typically, the airport does not have competing companies on the airfield. Instead, it seeks to attract complementary businesses that "cross-pollinate" by sharing ideas and using each other's services. "Getting the [tenant] community to work together really bodes the whole place well," Woodard comments. "(That) was always the goal - making everybody stronger." Partnering with organizations that share GEG's objectives for economic development is critical to the success of the airport and region, Krauter emphasizes. In 2011, the airport joined forces with the Spokane Chamber of Commerce, the local community college system, the city of Spokane, Spokane County and Avista, the electric and gas utility company that serves the region. The various entities formed Aerospace Initiative for Recruitment (AIR) Spokane to develop a proposal that would attract Boeing's 737-Max facility to the area. Ultimately, the aircraft manufacturer decided to keep that work in Puget Sound; but AIR Spokane stayed intact. "What we learned from that process is that we needed to keep that group together to continue to work on targeted aerospace supply chain company recruitment," Krauter relates. AIR Spokane subsequently funded a study to identify the strengths, weaknesses and opportunities of the area's workforce, existing aerospace companies, infrastructure, etc. The study's results were then used to create a recruiting strategy. "It's a much more focused approach [to economic development]," Krauter comments, crediting the increased power of pooled resources. In summer 2014, GEG announced a win: Exotic Metals Forming Company, a Boeing supplier, purchased 56 acres of airport land to build a 150,000-square-foot plant that is scheduled to open in summer 2015 and employ 150 people. "We are able to use our resources to leverage the attraction of businesses like that," Krauter explains. Complementary businesses like Exotic Metals Forming - those that benefit from proximity to the airport but don't necessarily need access to its taxiway and runway system - are key to GEG's plan for spurring regional growth. "We really look at what type of businesses are going to bring high-paying jobs to the region and generate more air travel demand for the airport," Krauter comments. "We have a very regional approach to aerospace business recruitment." Located about 300 miles from Seattle, Spokane offers businesses less expensive real estate and labor costs, but is still close enough to Boeing's assembly lines to ease travel for executives, he explains. GEG operates 23 flights per day to and from Seattle-Tacoma International Airport on Alaska Airlines and Delta Air Lines. GEG's total holdings include about 7,500 acres of land, including a former military base that was transferred to the airport under the Surplus Property Act and a business park. By Krauter's inventory, the airport has about 1,500 acres it could sell or lease for development. "We've been very aggressive with land acquisition and have a great inventory," he reports, noting that critical infrastructure is in place to help attract business. "If an airport has land, it requires more than just putting a sign out there saying 'land for sale or lease,'" he advises. "You need to focus on the strengths of the area and what role the airport can play to attract the highest paying jobs for whatever sectors that community is building."